Cube Entertainment has announced that they have opened the doors to a new personal studio for their artists to mark the start of a brand new adventure together! On April 10th, CEO Hong Seung Sung and his artists, 4minute, B2ST, G.NA, and BtoB all gathered to celebrate the opening of ‘Cube Studio’. Leaders from each respective group stood alongside their CEO to cut the tape for the grand opening. Although Cube Entertainment was established in 2008, this will be their first private studio where they will be using it as a foundation for their global marketing strategies. ‘Cube Studio’ will be aiding singers and musicians to better grow and advance with their skills. The studio will include facilities dedicated to the areas of vocal, composition, performance, production, and choreography training. 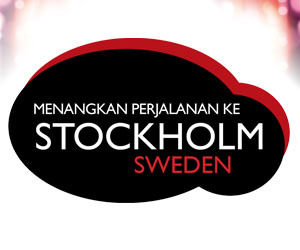 A special cafe for artists to be able to sit down and communicate with their fans will also be included in the studio. All profits from the cafe will be donated to charities of the company’s choice. 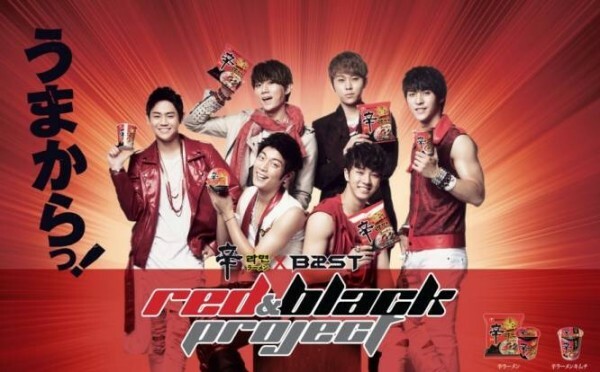 B2ST has released the Japanese CF for Korean food manufacturer Nongshim‘s Shin Ramen. The CF was released in two different versions, Red and Black. The new track “Red & Black” has also been inserted as the official song. In the red version, fans get to see the members’ fierce performance, while the black version is a more ‘rock’ version of the track. B2ST has been a huge hit in Japan after debuting with “Shock“, climbing up to #2 on Oricon‘s Weekly Album chart. Seeing how quickly B2ST was broadening their Japanese fan base, Nongshim decided to appoint them as their official spokesmodels and are reportedly looking forward to seeing B2ST’s marketing effects. The CMs will begin broadcasting on April 2nd in Tokyo, Osaka, Nagoya, Fukuoka, Hiroshima, and more. Fans will also get a chance to meet B2ST by collecting the three QR codes in the Shin Ramen Package Series. Nongshim will select 200 of the fans who will win a chance to attend a B2ST fan meet. In related news, B2ST is drawing interest from all over the world after launching a world tour, covering 14 different countries from Asia to Europe. 2AM has joined the list of singers with unique official fanlights. 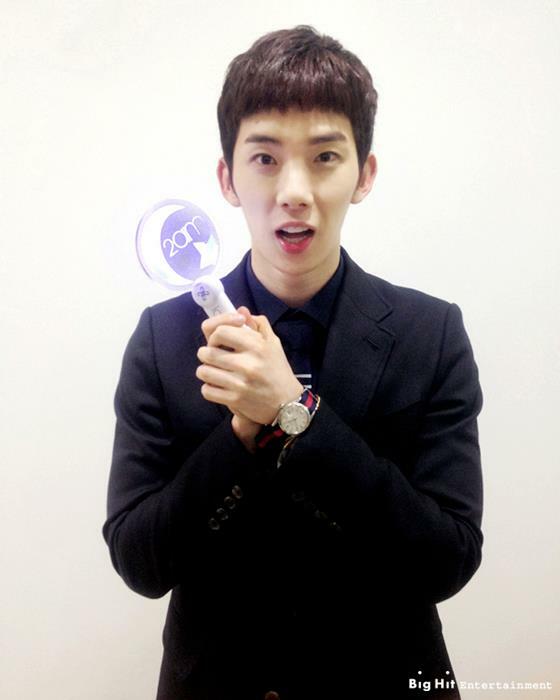 On March 21st, photos of Jo Kwon, Changmin, Jinwoon, and Seulong with their new official lightsticks were revealed on 2AM’s Facebook page. In the past, singer’s fanlights were basically glowsticks in the singer’s fan club color. Now fanlights are unique for each group. For instance, Big Bang has their signature yellow crowns, 2NE1 has their white winged spade, and B2ST recently changed their official fanlights to gray roses. Which group’s official fanlight is your favorite? B2ST‘s Hyunseung made his fans smile with a comical selca. Earlier today, Hyunseung tweeted, “Hamburger” and posted the above photo. 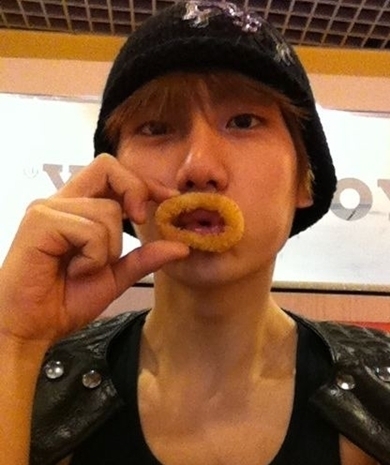 The photo shows Hyunseung playing around with an onion ring from a fast food restaurant and putting it on his lips. Despite his all black charismatic outfit, his aegyo makes him look adorable. "Kalian semangat banget. Apa kabar? Kami Beast." Keenam pemuda asal Korea Selatan itu tak henti-hentinya membuat fans berteriak histeris. "Kami baru sampai tadi pagi. Kebetulan kami suka K-pop." B2ST‘s Yang Yoseob sent a special ‘Love Call’ to his fans. Yoseob recently released a duet track with A-Pink member Eunji. 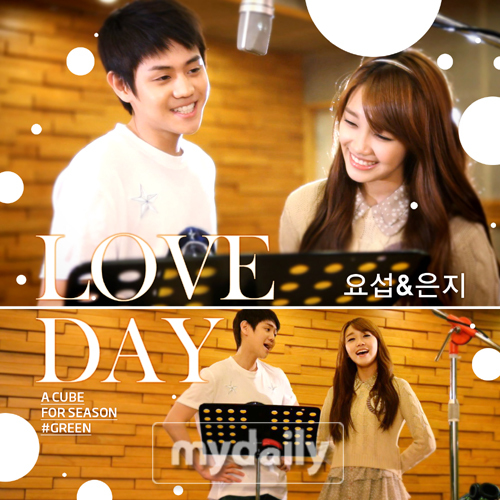 Their new song “Love Day” is for their agency A Cube’s new project, ‘A Cube For Season’. The best White Day gift a Yoseob fan could ask for, a dinner date.